Thanks to Karen Kilby for letting me know about Bibledex, a project at the University of Nottingham to produce Youtube videos on every book of the Bible. Several are already available. This one, on Matthew, is eight and a half minutes long and introduces lots of the key issues in the interpretation of Matthew, with contributions from Roland Deines, Anthony Thiselton, Pete Watts, Conor Cunningham and Simon Oliver. It's very nicely produced and it's remarkable how much they pack in while remaining lucid. I'll be adding these in due course to the NT Gateway. The others available so far are Genesis, Psalms, Amos, Song of Songs, 1 Corinthians and Philemon. Note: this is a different project from the St John's Nottingham videos, which I have mentioned here and on the NT Gateway. It seems like Nottingham is the place to be! 1. It is true that initially either Feuerverger himself or the folks he was working with used some careless language that mistated what was being concluded from his first set of calculations - the ones he did for the Discovery Channel. In this restatement, which you published, he did not reduce the strength of his conclusions, but what he did do was restate his conclusion using more precise statistical language. However, for his March 2008 article he actually published a second set of calculations which answers a different question, albeit probably relying on the same background material as he used for the Discovery Channel calculations. To the non-statistician, it might not have been apparent, but that's what happened. So, the odds calculations to which I referred in my article are not the calculations quoted in the Discovery Channel feature, I am using the second set of calculations. The manner in which these two calculations differ is somewhat subtle but important. Essentially, the first set of calculations have to do with how likely it would be to see a given set of names arise from a paticular tomb, while the later publication attempts to etimate the odds that the Talpiot Tomb is the family tomb of Jesus, given a set of names from the tomb. 2. Regarding the point about the views of the attendees at the Jerusalem conference, I actually agree that a signficant majority of the attendees do not accept that the Talpiot Tomb is the family tomb of Jesus. My point(perhaps clumsily made) was that even though that was the case, there are still many experts who think it is worth the effort to engage in additional study and discovery on this subject - which is what I intend to do. Toward that end I have just committed to bringing up a new website at www.talpiottomb.com. I expect to have it up around mid-November. The editorial position of the site is that we simply do not know with certainty whether or not the Talpiot Tomb is the family tomb of Jesus and that further study and discovery should be encouraged. The site will be intended for non-specialists who want some additional background material on the tomb and want to be guided through the various arguments for and against the proposition that this is the family tomb of Jesus. I will function as the editor, but I will try to create as little new material as possible. Rather I will attempt to guide readers to a balanced set of source material offered by experts on the subject. Prominent scholars Bart D. Ehrman, Mark Goodacre, Leonard Greenspoon and James Charlesworth tackle problematic and contentious issues of Biblical authorship. Plus, they share startling revelations about how and when the Bible was written. These are recordings of lectures we gave in Boston last November. I'm on disk one with Bart. His topic is "Is the New Testament Forged?" Mine is "When were the Gospels Written?" Full details here. The Talpiot Tomb: What are the odds? The article provides a useful reminder that divergent estimates on statistics and the tomb are the result of the prior assumptions that are fed into the calculations. This has always been, for many, the heart of the issue. The weakness of Feuerverger's statistical case was always that the data with which he worked (fed to him by Jacobovici) was, to say the least, highly debatable. It was a theme in the blogging about the Talpiot Tomb affair here and elsewhere from the beginning (see, for example, The Talpiot Tomb and the Bloggers I: An Early Success and links there). Before we get into the comparison of the results from the three sources, we first need to discuss the somewhat confusing circumstances surrounding the estimates provided by Feuerverger. Most people first became familiar with the Talpiot Tomb through two related sources, a Discovery Channel special entitled “The Lost Tomb of Jesus” and a book by Jacobovici and Pellegrino entitled “The Jesus Family Tomb”. In both of these sources, it was stated that the odds were 600:1 in favor of the proposition. This odds calculation came to be attributed to Feuerverger. This statement of odds left the impression that from a statistical point of view it was conclusive that the proposition was true and the Talpiot Tomb must be the family tomb of Jesus. Unfortunately, during early 2007, as this statement of odds got circulated in the press, its meaning got increasingly muddied. It was not until Feurerverger published a formal, refereed article in March of 2008 that it became clear that the original result attributed to Feuerverger was preliminary and that its meaning was somewhat distorted in the retelling. Therefore, all references to Feuerverger’s estimates will be from his March 2008 published paper . The decision to focus on the published article is certainly the right thing to do. The difficulty over the earlier stated estimates, however, was the result of Feuerverger's own earlier statements which he changed in the light of errors pointed out here by Joe D'Mello. I chronicled the story recently here in my post The Talpiot Tomb and the Bloggers I: An Early Success, to which I refer you for the details. That post features links to the original posts in which the case developed "in real time", as it were. What then do the content experts believe? Interestingly we can say something about the opinions of this group. In January 2008 Professor James Charlesworth of Princeton Theological Seminary, organized a conference titled “Jewish Views of the After Life and Burial Practices in Second Temple Judaism: Evaluating the Talpiot Tomb in Context”. At this conference, many of the leading authorities on the subject discussed the possibility that the Talpiot tomb was the family tomb of Jesus. Reports from the conference suggest that an important point was backed by the conference attendees; that the proposition, while not proven, was sufficiently likely that further study of this matter is warranted. [+ Note Reference to Michael Posner, "University of Toronto Scientist Puts Odds on Lost Tomb,"Toronto Globe and Mail, April 21, 2008]. To conclude, we wish to protest the misrepresentation of the conference proceedings in the media, and make it clear that the majority of scholars in attendance – including all of the archaeologists and epigraphers who presented papers relating to the tomb - either reject the identification of the Talpiot tomb as belonging to Jesus’ family or find this claim highly speculative. E. P. Sanders, Is Paul's Legacy Relevant Today? Although the compelling story of the discovery of the Nag Hammadi codices in 1945 is frequently narrated, it is not widely known that two scholars questioned the story and wished to distance themselves from it. The key bibliography for the story of the discovery is as follows. The fullest version of the story of the finds is in James Robinson, "The Discovery of the Nag Hammadi Codices", The Biblical Archaeologist, Vol. 42, No. 4, "The Nag Hammadi Library and Its Archeological Context" (Autumn 1979): 206-224. The most influential version is The Nag Hammadi Library in English (translated by members of the Coptic Gnostic Library Project of the Institute for Antiquity and Christianity; San Francisco: Harper & Row, 1977; rev. eds. 1988, 1996). The version in Elaine Pagels, The Gnostic Gospels (New York: Random House, 1979), which is based on Robinson's earliest account, has also been influential in other retellings. Now, Robinson's account is based on extensive research in and around the Nag Hammadi region, with many interviews on several occasions with the protagonists in the 1960s and 1970s. His achievement in digging up the original details of what happened a generation earlier, and in writing so fascinating an account, is a testament to the skills of one of the most important and influential scholars of the late twentieth century. Rudolphe Kasser and Martin Krause wish to make it known here that they have serious reasons to put in doubt the objective value of a number of important points of the Introduction that follows. They contest especially the detailed history of the discovery of the Coptic Gnostic manuscripts of Nag Hammadi resulting from the investigation of James M. Robinson. Kasser and Krause and others who were involved do not consider as assured anything more than the core of the story (the general location and approximate date of the discovery), the rest not having for them more than the value of stories and fables that one can collect in popular Egyptian circles thirty years after an event whose exceptional significance the protagonists could not at the time understand. R. K. and M. K.
The Facsimile Edition of the Nag Hammadi Codices: Introduction (Published under the auspices of the Department of Antiquities of the Arab Republic of Egypt. In conjunction with the United Nations Educational, Scientific and Cultural Organization; Leiden: E. J. Brill, 1984), 3. Although Robinson's account has often been retold, Krause's and Kasser's publicly stated objection to it has almost never been repeated. (I will discuss the exception next time). My guess is that this is more through ignorance than anything else. The quotation above is written in a tiny font in square brackets as the first few lines in a two-page footnote in the Preface of an expensive and highly technical volume, and that may explain why not many have seen it. So what are we to make of Krause's and Kasser's concerns? I have some further thoughts on the topic which I hope to post here in due course. . . . . The book reprints some selected posts, as well as including quite a few comments (and I think that debate actually makes the book). It also has an essay, by yours truly, on the nature of blogging -- and why I am a convert to the genre, despite many initial misgivings about dumbing down etc etc. . . . Sounds like an interesting experiment. Is this an example of the blog coming of age? Initially the idea seemed strange to me, but then one of the most enjoyable (to me) genres of book is the diary, something that initially belongs to a different forum than the published book, so perhaps it is not so daft. 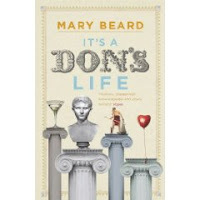 So which biblioblogger would you like to see following in Mary Beard's footsteps? Or would this not work in our area? Are we all a bit too dull? I uploaded the latest NT Pod on Sunday, a little later in the week than usual, because I had to prioritize other things. I hope it will be out a little earlier this week. The topic is Paul's Conversion on the Damascus Road. I wanted to explore each part of that descriptor, not least because it is still used uncritically and without reflection in a lot of contemporary scholarship. The part that does sometimes get discussed is the "conversion" bit, with people rightly pointing out that it may be preferable to conceptualize it in terms of a "call" rather than a "conversion", especially if one is attempting to see it as Paul sees it. I tend to associate this view most clearly with W. D. Davies, "Paul and the People of Israel," NTS 24 (1977-8): 4-39. The "Damascus Road" bit is less important than the question of "call" versus "conversion" but my aim is to remind ourselves that this is the way that Luke conceptualizes the event in Acts 9, Acts 22 and Acts 26, with his interest in key events happening on roads and on journeys. The gas that really fuels the fire of Greek comedy is exaggeration: Take a simple gag and blow it out of all proportion. Re-read some of Jesus’ sayings with this in mind and you might find a chuckle or two yourself: Your neighbor may have a speck in his eye, but you’ve got a log. The difficulty, of course, with reading humour in the Gospels is that, like any ancient text, it is impossible to know what the audience reaction might be. Unfortunately, the narrator never chips in with a little "And the crowd were amused by his teaching, for he taught them with humour, not like their comedians." If only. Incidentally, the Thomas version (Logion 26) loses much of the comic absurdity in its omission of the middle of the Synoptic version, where the man tries to remove the speck from his brother's eye while he still has the plank in his own (see in Synopsis here). This is one of those occasions where Thomas is less memorable and works less well orally than do the Synoptics. 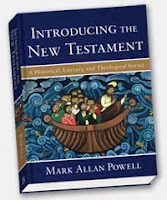 In my previous post, I offered some enthusiasm for the splendid looking new textbook for introductory New Testament classes, Introducing the New Testament by Mark Allan Powell, published by Baker. Regular readers will not be surprised to see me revisiting something of a bête noire in complaining about the way that the Synoptic Problem is treated in introductory texts, and there is no exception here. I must admit that the personal disappointment on this occasion was a little more pronounced than usual. It is several years now since I complained about the way that the Synoptic Problem gets treated in introductory books (The Case Against Q, Chapter 1), and I have done what I can, through books, articles, websites, blogs, to try to generate some awareness of a major alternative to the consensus view. Sometimes, this has met with success. But all too often, I have felt like Kierkegaard's clown, and no more so than here, apparently having made next to no impact on the way that the debate is framed, let alone the solutions that are offered. Let me try to explain why, and please forgive me for focusing in a major way on something that is clearly peripheral to Mark Allan Powell's interests, as it is to many other scholars. The difficulty for people like me is that the introductory textbook can do more than anything else in embedding ideas in students' minds, and it is a shame if they are not even given the framework within which to explore the problem in a balanced way. Powell's discussion of the Synoptic Problem (here called "the Synoptic Puzzle", 92-100), presents the Two-Source Theory as the solution to the Synoptic Problem and gives the Griesbach Theory as the main alternative (diagrammed on 97, sidebar on 99). I am grateful to Mark Allan Powell for adding a sentence about the Farrer theory (99) after I drew attention to the lack of mention in the manuscript, but all the books under "For Further Reading" are by defenders of the Two-Source Theory, and there are no arguments provided for the existence of Q. Q is largely taken for granted, and then explained. New students, therefore, do not have any framework within which they are able to question Q at the same time as affirming Marcan Priority. The website provides some supplementary materials, but here things are no more encouraging. There are Chapter 4 flashcards that give "Two Source Theory", "Q", "M", "L", "Four Source Theory" and "Griesbach Theory". Note that Marcan Priority is treated only in partnership with the Q hypothesis and not separately. Under "Extra Content", 4.5 Proposed Solutions to the Synoptic Problem (also available as a PDF), four solutions are listed, "Augustine's Solution", "The Two-Gospel Hypothesis", "The Two Source Hypothesis" and "The Four-Source Hypothesis". In a summary on the "Status of the Synoptic Puzzle in the Twenty-First Century", the Farrer theory and its proponents are not even mentioned. (1) With regard to sequence of events, Matthew and Luke frequently agree with one another and with Mark, but they never agree with one another against Mark. This suggests that Mark served as a basic outline used independently by both Matthew and Luke, who sometimes followed him and sometimes did not. If (as an alternative proposal suggests) Mark had copies of both Matthew and Luke and produced an abbreviation of their works, we would expect instances in which Mark departed from a sequence of events followed by both Matthew and Luke, but that never happens. This argument is problematic because it is expressed in terms of opposition to the Griesbach Theory. The fact that Luke usually follows Mark's order is not a problem for adherents of the Farrer theory, for whom Luke is prioritizing Mark over Matthew and, like Matthew, using it as "a basic outline". The "never" is also incorrect since there are minor Matthew-Luke agreements against Mark in order. (2) Neither Matthew nor Luke ever includes the other’s additions to the Markan text. This is simply an error. The reason that the Two-Source Theory invokes categories like "Mark-Q overlaps" and has to spend time discussing "Minor Agreements" is that there are many triple tradition passages in which there are substantial agreements between Matthew and Luke against Mark. (3) The likelihood that either Matthew or Luke used the other as a source is reduced by what would then be inexplicable omissions of material. The argument from omission is always a problematic one, not least given the fact that every theory has to cope with omission at some point. It often simply amounts to a statement of what we would have done if we were one of the evangelists. The only example Powell gives of an implausible omission by Luke is Matt. 25.31-46 (Sheep and the Goats). If I were Luke, I don't think I would include it, with its characteristically Matthean judgement day scenario of divisions into two groups, sheep and goats, wheat and tares, wise and foolish, good and bad, and eternal hell-fire for the second group. But that may not be right; it is always a guess to say why we imagine that Luke omitted any material, likewise with the huge chunks omitted from Mark, including material we might think to have been congenial. (4) The material that Matthew and Luke have in common but that is not found in Mark is never found at the same place in their Gospels. This is another error. One of the difficulties for the Q theory is that Matthew and Luke sometimes integrate double tradition material with triple tradition material, especially in Matt. 3-4 and Luke 3-4, but also elsewhere. The reason that there is a category called "Mark Q overlap" is that "the material that Matthew and Luke have in common but that is not found in Mark is" sometimes "found at the same place in their Gospels." So, once we get to arguments for the existence of Q, they are not especially impressive, which is a shame given that the actual text seems to express some confidence in the existence of Q. All in all, I remain optimistic, though. Where Q is sustained either by ignoring the arguments against it, or by reproducing weak arguments in its favour, it is surely only a matter of time before an Introduction to the New Testament is produced that at least takes seriously the Q sceptical view. I was delighted to receive in the post a copy of Mark Allan Powell, Introducing the New Testament: A Historical, Literary and Theological Survey (Grand Rapids: Baker, 2009). In the interests of full disclosure, I should explain that I was asked to write an endorsement for the book and chose not to do so because of what I regarded as its deficiencies in the discussion of the Synoptic Problem (and so it is particularly nice of Baker to send me a copy anyway!). I will explore its treatment of the Synoptic Problem a little more in a future post, but before doing so, I wanted to take a post to enthuse about the book lest my future post seemed to be trying to take out the speck in my brother's eye. Powell's introduction looks splendid. It is beautifully illustrated, with well chosen colour pictures from Christian art across the centuries. And the layout is splendid, with the text constantly broken up with nice little boxes and sidebars, bulletpoints and charts. It is very easy to navigate, rightly boasting that it is the kind of textbook you can dip into at any point. The discussion is crystal clear, easy to read and usually fair and accurate. My guess is that it will be a direct rival to Bart Ehrman's Historical Introduction, now in its fourth edition, and now, just in the nick of time, with similar lavish illustrations. It will be a while before I can get a feel for whether Powell could do the unthinkable and replace Ehrman as the first-stop introduction, not around here in the heart of the Triangle, of course, but in places further afield. One of the values of the new book is a website called Introducing the New Testament, a companion site that features lots of extra hand-out style student resources. The pottery was red slip ware, distinguishing it from the creamy color of the modern Qina ware common in the region, and had four small handles near the opening. The jar was also large, with dimensions roughly illustrated by Muhammad 'All as 60 cm or more in height and an opening of some 15 to 20 cm widening to some 30 cm in the flank. The jar had been closed by fitting a bowl into its mouth. Khallfah had taken this bowl with him to the home in al-Qasr where he was a servant for the Copt, Salib 'Abd al-Maslh, who preserved the bowl intact. It is Coptic red slip ware of the 4th or 5th century with a rim decorated with four fields of stripes. The diameter at the outer edge is 23.3-24.0 cm, with a diameter inside the bowl of 18.2-18.7 cm, adequate to close a mouth large enough to admit the codices, whose broadest leaves, in Codex VII, measure up to 17.5 cm. There are a few black tarlike stains about 2.0 cm from the outer edge on the under side of the rim, perhaps vestiges of a bitumen used to seal the bowl into the jar. Thus, the jar probably could not be opened readily to investigate its contents, which would explain why it was broken by its discoverers." (Biblical Archaeologist (1979), 213-4). So it was 60 centimetres tall, which is just under two feet. However, in Elaine Pagels's The Gnostic Gospels (New York: Random House, 1979), Pagels says that the jar was "almost a meter high" (xiii), which is already a lot bigger than Robinson's estimate of "60 cm or more". One meter is 3.28ft. So the jar has grown from just under two feet to well over three feet. Subsequently, the jar almost doubled in size. In repeated interviews and at least one publication, Elaine Pagels has stated that it was a "six-foot jar". The first example of this that I am aware of is in the 1987 video I linked to recently, a clip of Elaine Pagels teaching. It is "six feet" again in the PBS From Jesus to Christ documentary I linked to recently, from 1998. It features also in written interviews and then in print, in Beyond Belief: The Secret Gospel of Thomas (New York: Random House, 2003), 97. A six foot jar would be huge, and is far larger than the 1.97 foot jar of the earliest accounts. I don't know where the six foot measurement came from but my guess would be that Pagels simply forgot the measurements and then, having said "six-foot jar" once, made it part of the repeated story. That can happen in story-telling. We introduce an error inadvertently, but then re-tell it and embed it in our story until we forget the origin. I am grateful to Mike Grondin over on the Gospel of Thomas e-list for first pointing out and questioning the "six foot jar" motif from the 1987 video mentioned above, which led me to explore the different measurements of this growing jar in these other publications. It is great to hear the good news that the University of Sheffield's Biblical Studies department is safe, the key news being the announcement that they will be taking undergraduates next year. Well done to all those who campaigned to turn this situation around. Like many, I first heard the good news via the Facebook group, but you can read it here on Jim West's blog, which has been up to speed throughout the affair. As several have already commented over there, the victory is at least partly due to the power of building a case through social networking and blogging. James McGrath and I have often sparred on the Synoptic Problem on our blogs, and it is nice to see a post today on Exploring our Matrix about my book The Case Against Q, headed Beyond Literary Dependence and Independence. It's nice to see James saying some nice things about the book and even nicer to have some critical engagement. I would like to make a few comments on James's comments.
. . . even after reading the book I still find it unlikely that Luke used Matthew's Gospel as a source in the sense of having it open in front of him as he composed his Gospel (Italics original). I think the topic of the mode of one author's use of another text is a useful one. I have not claimed myself that Luke had a copy of Matthew "open in front of him", though I think that that is likely when it comes to passages of very close verbatim agreement, which are common in the double tradition. But even there, I would be wary of the idea of the author-as-scribe. I am more inclined to imagine Luke having a copy of his source text in his hands and dictating to his scribe. Nor would I rule out the use of memory. I think Luke knew his sources very well, but he knows Mark much better than Matthew, which is why he consults Matthew directly more often. In his composition, I would imagine that Luke's use of his sources varied, sometimes close, sometimes free, sometimes in between. In the case of the Birth Narratives, my guess would be that Luke did not have a copy of Matthew's Gospel in his hands, and that the agreements are the result of his memory of Matthew's text. The differences between Matthew 1-2 and Luke 1-2 are clearly important to James and I doubt that there is anything extra that I can say here that would persuade him of my view. I would just underline that history and tradition have generally preferred Luke's version and so his revision of Matthew's idea, if that's what it was, was a success. I would again mention that contradicting source material does not necessarily indicate non-use of the source and, moreover, it is worth asking how it was that Luke came up with the idea of appending a Birth Narrative to the Marcan structure? It is particularly odd to find Luke making this move when he clearly sees the "beginning" of the key events as marked by the baptism of John (Luke 3.1-2, Acts 1.22, Acts 10.37). I am pleased to see that James welcomes my "recognition that the dichotomy between literary dependence and independence of Gospels is a false one". I tend to think that the Q hypothesis is actually stuck in a literary mind-set because of its inclination to project everything onto a hypothetical document, so that tradition-history often gets confused with literary priority. But James asks about the possibility that oral tradition might have conveyed Minor Agreements between Matthew and Luke like that against Mark 14.65 ("Who is it that smote you?"). Of course this is possible, but I think it is problematic in this context. The argument from the Minor Agreements is a specific response to the claim that Luke never agrees with Matthew against Mark. It is hardly an answer to that data-claim to say that the agreement could have been mediated through oral tradition. The admission nullifies the claim that Matthew and Luke do not agree together against Mark. The fact is that they often do. And regularly, it is agreement of the kind that we would normally ascribe to simple redactional reworking, and not to variant tradition. To put it another way, if we had only Matthew and Mark here, would we hesitate to say that Matthew has simply redacted Mark? It is only the presence of agreement with Luke in a theory that postulates independence that is leading to the oral tradition claim. John 5.8: Ἔγειρε ἆρον τὸν κράβαττόν σου καὶ περιπάτει. This is a six word verbatim agreement, seven if not broken by καί, including an unusual word, κράβαττόν. It's the kind of material that may show familiarity (not direct "literary dependence") between John and the Synoptics (cf. my earlier post about the direct links between the Synoptics and John 12.1-8). One more point. James mentions that he sticks with Q as a "working hypothesis". My difficulty with this kind of argument for Q (cf. Case Against Q, 75-77) is that a hypothesis is not tested by its usefulness. All sorts of erroneous hypotheses are useful and, on a certain level, they work. Seven-day Biblical creation was a useful working hypothesis for millennia. The reason that erroneous hypotheses remain persuasive is often because they work; they are attractive; they appeal to culturally determined elements in our thinking. Thanks again, though, James for some enjoyable reflections and for taking the time to think seriously about my stuff -- a real compliment. Congratulations to two of our own, AKMA (AKM Adam) and Paleojudaica (Jim Davila), who are included in the 100 Best Professors Who Blog list [Link removed, 28/5/2013, at request of site]. Back in 1998, there was a lot of talk among American e-listers about the PBS series From Jesus to Christ, a four-part exploration of the origins of Christianity that was generally thought to be a well produced documentary. The programme made a bit of an impact overseas too, partly because of a fantastic website and partly because it was repackaged and sold abroad. In the UK, we had it on Channel 5, with Terry Waite providing extra linking materials. I have always been a fan of the website, and I continue to recommend parts of it to my students to this day. "From Jesus to Christ: The First Christians" tells the epic story of the rise of Christianity. The four hours explore the life and death of Jesus, and the men and women whose belief, conviction, and martyrdom created the religion we now know as Christianity. You can see scholars like Michael White, Elaine Pagels and Paula Fredriksen discussing Christian origins, and there are some nice visuals too. If you are interested, as I am, in the discovery of the Nag Hammadi documents, then take a look at Part Two, Chapter 7, Christianity in the 2nd and 3rd Centuries. They have even added a little page on me and my paper now. Almost all of the details of the papers, with abstracts and bios, are now available. The excavator in Egypt is not much troubled by the restrictions which hamper the independence of employers of labor in this country. There is no question there about an eight-hours day. Sunrise to sunrise, with an hour off at noon, makes a nine to eleven-hours day even for the youngest, and one does not hear much about "half-timers." As the papyrus digging was comparatively light work, I had more boys than men diggers, the former being not only easier to manage and more trustworthy, but quite as keen about the work as the men, which is rather remarkable, seeing that all their earnings go to their parents. But I should think nearly every boy in the district who could walk wanted to be taken on to the work. Some of the tiny applicants really looked as though they had only recently left their cradles, if they had ever known such luxuries, which, of course, they had not. One of the smartest workers of all was also the smallest, a little chap of about eight years old, who had a wonderful eye for the right kind of soil for finding papyri. I am afraid some tender-hearted persons would have thought me a very brutal taskmaster, if they could have seen some of these children lifting and carrying away heavy baskets of rubbish all day, clothed, perhaps, if the weather was hot, in nothing but a cap on their heads and a piece of string around their waists. But I think the same persons would have retracted their opinion, if they could, at the end of the day's work, have seen the said infants racing each other home over the sand dunes, while I plowed my way painfully in the rear (Bernard P. Grenfell, M.A., "The Oldest Record of Christ's Life", McClure's Magazine Oct. 1897; Vol. IX, No. 6, 1022-30 (1029-30). In a comment on my recent post on Grenfell and Hunt, Andrew Bernhard reminded me of his excellent new resource, The Gospel of Thomas Resource Center, which gathers together lots of material of interest on the Gospel of Thomas, including some of his own material and links to other good stuff. I had not realized before that there was a high resolution zoom-able image of P.Oxy 654 at the British Library, for example, and the full text of the McClure's article by Grenfell which I mentioned last time, The Oldest Record of Christ's Life. NT Pod 16: How long was Jesus' ministry? I uploaded the latest NT Pod on Saturday, a little later in the week than usual. I hadn't got enough writing done and so had to hold off for a bit. I hope to be releasing episode 17 a bit earlier in the week this week. The topic is something that is utterly pervasive but which has no basis at all in the text, the idea that Jesus' ministry lasted three years. It's very commonly stated in devotional and other literature, you find it in fiction and film and so on. But hey, I don't need to repeat everything I say here. This is just to add a note in my NT Blog given that I know some access the podcast by this route (See also NT Pod; Subscribe in a reader; Subscribe via iTunes U). The little clip at the end is of Ted Neeley, "Gethsemane", from Jesus Christ Superstar (dir. Norman Jewison, 1973), "After all I've tried for three years . . . " I couldn't get it out of my mind, like a lot of Jesus Christ Superstar songs, when I was recording this episode. I am delighted to see Chris Heard launching a new podcast on the Hebrew Bible, the Higgaion podcast. Episode 1 is out today and provides an enjoyable introduction to the series, with great theme music. It's five minutes long, even shorter than the NT Pod (though the NT Pod began at 5 minutes and grew to 10-12). I am looking forward to more. It's great to see the support all over the net for the Biblical Studies department at Sheffield. For the latest news, go to Save Biblical Studies, which is mobilizing support, and add the text of the letter you have sent to the vice chancellor. The Facebook group continues to add supporters and now the SBL has issued a Call for Action. Jim West broke the bad news, A Great Injustice is About to Occur, earlier today, that the Department of Biblical Studies at the University of Sheffield is under threat of closure. The fullest and most recent news appears in a blog post by an officer in the Sheffield Students Union. What can we do? Join the Facebook group and get in touch with the university to express your opinion. The Sheffield Biblical Studies department has been a pioneer over the last generation, and is one of the most exciting places to study the Bible in the UK. It would appalling if it were to close. A site called Save Biblical Studies has been set up to provide information and to encourage people to campaign against this move. The effect was enhanced by the peculiar postures and gestures in which his nervous energy found continuous expression. Shoulders hunched, a talon tensed now before him, now half behind him, scowling like some oriental demon, prowling like one of his beloved cats, or scrabbling among the piles of books and pamphlets that littered his room, he was a fascinating and unforgettable figure, unlike anyone else. But I also loved the note that "The worst vice in a scholar, in his view, was to be boring, and of that he was never guilty". I was amused by the remark that he disdained "the parades of erudition with which many scholars inflate their footnotes". I mentioned earlier the documentary The Gnostics, broadcast on Channel 4 in the UK in 1987. Both Brent (in comments) and April De Conick note that a book accompanied the series, Tobias Churton, The Gnostics (London: Weidenfeld and Nicolson in association with Channel Four Television Co., Ltd. and Border Television, 1987). There are tons of copies of the book available second hand on the net. I wish I could say the same of the video, which is very scarce indeed. Luckily, we have a copy of the book in the library here and there is a lot of material of interest. I found it at the Hamra Dūm mountain in the December of 1945. By 6 o'clock in the morning when I started my work . . . all of a sudden I found this pot. And after I found it I had the feeling that there was something inside it. So I kept it, and because it was cold this morning . . . I decided that I would leave it and would come back again for it to find out what's inside. I came back in the same day in fact, and I broke this pot. But I was afraid at the beginning because there might be something inside it -- a jinn, a bad spirit. I was by myself when I broke the pot. I wanted my friends to be with me. After I broke it I found that it was a story book. I decided to bring my friends to tell them about the story. We were seven and we realized immediately that this has something to do with the Christian people. And we said that we don't really need it at all -- it was just useless to us. So I took it to the ministry over here and he told me, well we really don't need it. It was just rubbish for us. So I took it back home. Some of them were burned and I tried to sell some of them (The Gnostics, 9). The definitive version of the story of the discovery is told by James M. Robinson in a variety of places, but most fully in "The Discovery of the Nag Hammadi Codices" in The Biblical Archaeologist, Vol. 42, No. 4, "The Nag Hammadi Library and Its Archeological Context" (Autumn 1979): 206-224. Robinson's brilliantly told account is based on several visits to Nag Hammadi, and extensive discussions with Ali and others. It has been celebrated and repeated in multiple accounts, all of which are ultimately derived from Robinson's version. The account above is interesting both for what it has in common and for how it diverges. In several respects it is clearly inferior to Robinson's narrative -- it is a decade or so later, it is more sketchy, it is more self-obsessed -- but to hear the man himself speak (through an interpreter) is most interesting. As in Robinson's account, there is the note about the fear of the jinn, and the worrying note about the burning of "some of them". In contrast, though, Ali here represents himself as the sole discoverer of the codices in contrast to Robinson's account which names his brother Abū al-Majd as the one who uncovered the pot. Further, there is no suggestion in Robinson's account that Ali was alone when he discovered it. Quite the contrary. There, he already has the six others (two brothers and four others) with him on discovery. I am guessing that "ministry" is a slight mistranslation for "minister", which would make the piece cohere with Robinson's account. Churton has a little more in his own words on the following pages and his narrative largely follows the lines of Robinson's on which it is, I think, partially dependent. But there are some additional elements including a quotation of Ali on the revolting blood vengeance, "I took my knife and cut out his heart and ate most of his pieces" (11), and there is more on the police investigation and detainment in prison. I would guess that the confident assertion about "December 1945" is superimposed by Ali's discussions with Robinson in the 1970s, a major part of which involved the attempt to date the find. If Ali had already known then that it was December 1945, it would hardly have been necessary to have spent so long locating the discovery, with the discussion of the murders and when they happened. I suppose that one of the elements that also comes through in Ali's comments here is just how insignificant the discovery was to him, especially in relation to the big issue of the blood feud. These were just story books and, what's more, other people's story books. It's no surprise that his memory was very sketchy. I blogged yesterday on an old Youtube video about the Discovery of the Nag Hammadi Codices. The video features James Robinson, Gilles Quispel, Elaine Pagels and Muhammad Ali, the man who discovered the codices. At that point, I was unsure about the origin of the video and guessed that it dated from the early 1980s. Some further research has yielded some more information, and I can see now why I was hitting a brick wall before. I worked out that the series was called The Gnostics from a notice in Alexandria: The Journal of Western Cosmological Traditions 1995, 459, in its "Books in Brief" section, where it describes the series from which the clip had to have been taken. But it erroneously gives it as a BBC series, and that threw me off. A trip to the British Film Institute archive reveals that this was a Channel 4 series which aired in four parts in 1987, and that it was made by Border. So my guess about the dating was in the ball park but, as so often with dating guesses, it was a little too early. A comment on my previous post from Brent helped to confirm the identification. See too the discussion on the Gospel of Thomas e-list. More about this programme later. I've been digging around for materials on the discovery of the Nag Hammadi Codices and found this remarkable piece. It is pretty terrible quality, pulled from a VHS of an old documentary, and with Dutch subtitles. But the interest is in showing footage of Muhammad Ali al Samman, who discovered the Nag Hammadi codices in 1945, alongside the late Gilles Quispel. There is a long Pasolini-style camera gaze at Muhammad Ali for several seconds after Quispel says that his discovery will "change the mind of millions". So what is this video? The uploader tags it as "The Discovery of the Nag hammadi Library", but a little digging has suggested to me that this is a clip of a BBC documentary called The Gnostics. I can't find out the date of the documentary but I am guessing that it must be early 1980s. Clearly it has to post-date Robinson's narrative of the discovery, which first appeared in 1979, and the appearance of Pagels would suggest that it also post-dates her Gnostic Gospels, also published in 1979. Ali clearly looks a bit older than his (mid 70s?) photograph in Robinson's 1979 article. My guess would be that this documentary dates from about 1983-4. I am struggling to find much more than this, though. The Oxyrhynchus Hymn (P. Oxy. XV 1786) is the earliest known manuscript of a Christian hymn - dating from the 3rd century AD - to contain both lyrics and musical notation. It is now kept at the Papyrology Rooms of the Sackler Library, Oxford. The text, in Greek, poetically invokes silence so that the Holy Trinity may be praised. Crystal also provides a really clear picture of Grenfell and Hunt together. It is also available here, on the Egypt Exploration Society's Flickr account. In the past, the main problem with Duke was institutional. The PhD program is run through the Duke University department of religion, and only a couple of students a year were admitted to study theology. The PhD program is actually run by the Graduate Program in Religion, a collaborative venture involving both the Department of Religion and the Divinity School. It is true that only one or two students are admitted to the theology track each year, but there are eight or so students admitted to the program as a whole. I have been doing a little reading and research on the discovery of the Nag Hammadi codices and was pleased to come across pictures of the men who made the discovery. I can't reproduce them here because of copyright restrictions, but I can describe them and link to them. When people tell the story of the Nag Hammadi finds, they often neglect to mention of the man who actually, according to James Robinson, uncovered the pot containing the codices, Abū al-Majd, who was fifteen at the time. The picture here, in the Claremont Colleges Digital Library, Nag Hammadi Archive, was taken by Robinson in 1978. If you are familiar with Robinson's original 1979 article on the discoveries, you will recognize the photograph. Claremont's Digital Library also has a picture of the man usually associated with the discovery, Muhammed Ali. This picture is different from the one that appears in Robinson's classic 1979 article. It dates to 1975 and features Ali in front of a stove, perhaps like the one in which his mother is said to have burnt some of the pages her sons discovered. Given Robinson's chilling account of the revenge murders back in 1945-6, looking at the faces of the murderers who happened upon the Nag Hammadi codices is a somewhat different experience from looking at the pictures of Grenfell and Hunt, who discovered the Oxyrhynchus papryi half a century earlier. Professor Sir Hugh Lloyd-Jones, the former Regius Professor of Greek at Oxford University, who died on October 5 aged 87, was a gatekeeper for a particular style of traditional scholarship and one of the foremost classical scholars of his generation; his imposing output of scholarly works ranged across the fields of Greek epic, lyric, tragedy, comedy, Hellenistic literature, religion, intellectual history – and beyond. I was lucky to meet Hugh Lloyd-Jones once, in March 2003, when lecturing at Wellesley College, Massachusetts, where he spent his retirement with his wife, the classical scholar Mary Lefkowitz. It looks like a good line up, with several papers of interest, e.g. Bart Ehrman on "Early Christian Counter Forgeries", April DeConick on "The Magical Judas: Iscariot’s Gospel and Gem" and Craig Evans on "Jesus and the Exorcists: What We Learn From Archaeology". Full list at the link above. The Gospel of Thomas is perhaps the most controversial early Christian text. Some think that it emerged as an early, autonomous sayings gospel that provides important evidence for research on the Historical Jesus and Christian origins. Others think that it is a later text, useful primarily for shedding light on the development of Christianity in the second century. The key that unlocks the problem is substantial evidence that Thomas knew and used the Synoptic Gospels. I will attempt to explain how, when and why this happened. I released the latest NT Pod yesterday, Episode 15 on The Gospel of Thomas: The First Glimpse. That term "the first glimpse" refers in particular to the story of Bernard Pyne Grenfell (1869-1926) and Arthur Surridge Hunt (1871-1934) who glimpsed fragments of what later turned out to be the Gospel of Thomas in their excavations at Oxyrhynchus in 1897 (which unearthed P.Oxy 1) and 1903 (which unearthed P.Oxy 654 and 655). This posts adds a few additional programme notes. This is the first of a series of NT Pod episodes I am planning on the Gospel of Thomas (though not back to back; I'll be interspersing with other episodes) and I wanted to begin the story here, in 1897, with the discovery of P.Oxy 1. This is not where people usually begin the story of its modern discovery. It is standard to begin with Mohammad Ali's discovery of the Nag Hammadi codices in 1945, to which Grenfell and Hunt's discoveries are appended as a kind of afterthought. It's easy to see why -- the Mohammad Ali story is exotic, romantic, dramatic, and brilliantly told by James Robinson. But I find myself having a little more in common with a couple of Oxford trained academics who went searching for ancient texts than I do with a murderous Egyptian who stumbled upon them, and it's the right place to begin the story. Later in the week Mr Hunt, in sorting the papyri found on the second day, noticed on a crumpled uncial fragment written on both sides the Greek word ΚΑΡΦΟΣ ("mote"), which at once suggested to him the verse in the Gospels concerning the mote and the beam. A further examination showed that the passage in the papyrus really was the conclusion of the verse, "Thou hypocrite, cast out first the beam out of thine own eye, and then shalt thou see clearly to pull out the mote that is in thy brother's eye;" but that the rest of the papyrus differed considerably from the Gospels, and was, in fact a leaf of a book containing a collection of sayings of Christ, some of which, apparently, were new. More than that could not be determined until we came back to England. (From Bernard P. Grenfell, M.A., "The Oldest Record of Christ's Life", McClure's Magazine Oct. 1897; Vol. IX, No. 6, 1022-30). One of the delightful elements of studying Grenfell and Hunt's discoveries is the way that they so quickly have an idea what it is that they have found, and you get a feel for the excitement of the discovery. Their publication of their findings was often remarkably speedy, as with P.Oxy 1 here, the same year, 1897, that they discovered it. Logia Iesou: Sayings of Our Lord from an early Greek papyrus discovered and edited, with translation and commentary, by Bernard P. Grenfell and Arthur S. Hunt, Published in 1897, for the Egypt Exploration Fund by H. Frowde (London). New sayings of Jesus and fragment of a lost gospel from Oxyrhynchus, ed. Bernard P. Grenfell, Lucy Wharton Drexel, Arthur S. Hunt. Published in 1904, for the Egypt exploration fund by Oxford university press, American branch, H. Frowde (New York, London).